Well, the world's come to an end again. Damnit, Todd, I told you that "the nuclear option" didn't mean just launching all the missiles and hoping for the best. Now we've got to find ways to survive in this post-apocalyptic wasteland. Thankfully, we used to play a bunch of Wreck Age, so we're well-prepared. And with those updates in the 2nd edition, it'll be that much easier. If you'd like to be like me and Todd, super-prepared for the end of civilization, I suggest you get a hold of the new 2nd Edition of Wreck Age, which is available now. The 132 page Wreck Age rule book gives you everything that you need to get started playing. Welcome to The Resurgence. Welcome to the Wreck Age. Wreck Age is a dystopian, post-Exodus adventure game, where struggling communities vie for resources on a post-collapse Earth. In the 23rd century, the Earth verged on total annihilation. Rapid climate shifts, caused by centuries of industrial pollution and nuclear waste, had brought the planet to the brink of an ecological meltdown. Countless reparative efforts had failed; each solution was too little and far too late. Left with no alternative, world leaders collaborated on a last-ditch effort to save humankind: the Exodus. It was a bold plan involving several waves of evacuations, with the end goal of colonizing new planets. The Exodus promised survival for everyone. It was an escape from a decaying planet. The brilliant, the rich, and the powerful gathered their families, their valuables, and their resources for the first wave. They left Earth in a flotilla of arks, scientific vessels, and seed ships. Within a few days, however, it became clear that there would be no second wave. Hope mutated into rage as the ill-fated masses realized they had been left behind to rot. Governments fell apart and economies crumbled; the world collapsed into anarchy. As society collapsed, so too did the Earth itself. The oceans rose, natural disasters ravaged the coasts, and chemical rain scorched the arable land. Countless species vanished, either slaughtered outright or dying en masse, unable to adapt to the perilous new environment. As catastrophes crashed down one after another in a crescendo of failure, humanity itself came dangerously close to extinction. Since the Exodus, uncounted generations have eked out a harrowing, threadbare existence with what little remained. Now a new world is emerging from the ashes. Every storm eventually passes; every desolate winter eventually melts into a fragile spring. Yet the scars of suffering and chaos remain. Recovery will be slow and painful. Few grand cities remain, and even fewer great leaders. There is no centralized structure. The powerful fight over the scraps of the old world, while the weak struggle just to make it through another day. • Everything you need to get started (except dice and miniatures) - with rules for campaign play, and a variety of encounters that you can jump right into. • Quick character generation - using Archetypes and a simple system called Resource Units to both create and advance your Characters, you can get your group scavenging The Wilds in a matter of minutes. • History and background information - explore the Merikan Wilds to their fullest. From the Washed Coast to the Glades, from the skeletal towers of Man Hadden to the colorful and chaotic sprawl of Esperanza, the fledgling towns and crumbling cities make up the character of the world. • Campaign rules - allowing you to develop your crew into hard-shelled heroes (or villains) of The Wilds. • Community Creation and Structures - build your own community, quite literally. Playable Structures interact with characters on the tabletop, allowing you to expand your campaigns in directions never before seen in a tabletop miniature game. • 8 playable factions - and if you decide to go faction-less, and set off on your own, you can do that too! and short stories set in the universe. Quick character generation - using Archetypes and a simple system called Resource Units to both create and advance your Characters,you can get your group scavenging The Wilds in a matter of minutes. 4 Training levels to choose from, from mass amounts of Green Characters, to Trained, Veteran, or even Elite members of your crew. Build the type of force that you desire, led by your Player Character. More than 30 Archetypes to allow you to create: Caravaneers, Soldiers, Doctors, Mechanics, Wastrels, Miners, Merchants, Scavengers, many more! We even added some extras in the back of the book, since we wanted to cram so many in! Utilize a host of companions, from pack animals, to mindless automatons, to attack boars packed with explosive rigs! 50 total traits and feats to flesh out and customize your characters, giving them plenty of room to grow and advance. Scriveners, are the warrior scribes of the technology obsessed Reclaimers. Outriders, are the eyes and ears of a Staker community. They are post-collapse rangers with an aptitude for survival. Administrators, wield a variety of advanced medical technology, often to harvest the body parts of their "patients". Locusts, are the un-tested warriors of the Drifter tribes, descending upon their enemy in a seemingly endless swarm. Wagon Bosses lead their caravans across The Wilds, searching out salvage and trade wherever they can find it. Campaign rules - allowing you to explore the Merikan Wilds to their fullest. From the Washed Coast to the Glades, from the skeletal towers of Man Hadden to the colorful and chaotic sprawl of Esperanza, the towns and cities that make up the small pockets of humanity make up the character of the world. 9 playable factions - and if you decide to go faction-less, and set off on your own, you can do that too! Drifters are nomadic warbands descended from criminal gangs that had been freed during the Exodus and subsequent collapse. They value strength and live by a strict hierarchical code of violence and plunder. They believe that anything and everything should be earned through force, and that the world is theirs for the taking. Almost immediately after the Exodus, the resilient, the far-sighted, the idealistic, and the indolent banded together to form the closest approximation of long-term stability they could imagine. Those that still remain are known as Staker communities, the modest and hopeful amidst a world of cruel opportunism. The Reclaimers are the world's foremost authority on scavenging. The e-wastes of North America and the rest of the world hold a veritable trove of disjointed information and oddly situated technology. With single-minded zealotry, they aim to collect and to re-assemble the pieces of this grand technological mystery, to learn about the mistakes of the past, and how technology might someday lead the diligent back toward humanity's rightful place. During the Exodus, a ship carrying specialized medical personnel crash-landed before exiting atmosphere. The carnage was horrific, but the ill-fated flight had been loaded with skilled experts in the field of life-longevity and advanced medicine. To extend their lives, they needed a supply of organs, and soon set out in small bands in order to carve, quite literally, a place for themselves in the harsh environment of Merika. Some of these hapless few are rumored to exist to this day... and are known as Stitchers. The ARHK are a conglomerate of corporate entities that skipped the Exodus under the ominous notion that it would be better to reign on Earth's shell, than serve on other planets. The Church of Fun are unapologetic hedonists who spread mayhem and callous merriment - a riot fueled by mind-bending chemicals. Tomorrow does not exist. There is only now. Unicephalon: is a secretive society that keeps close watch on the remains of planet Earth. Once a mega-corp, Unicephalon stood by and watched as billions perished. Now, from secret locations, they send agents back into the world to shape events in accordance with their secret directives. No Ghosts are a part of the Fringes, and are cast-outs from Drifter tribes. They find solace where they can, and often sell their services as wasteland mercenaries. rom Drifter tribes. They find solace where they can, and often sell their services as wasteland mercenaries. Wreck Age comes complete with rules for campaign play, as well as a variety of encounters that you can jump right into. 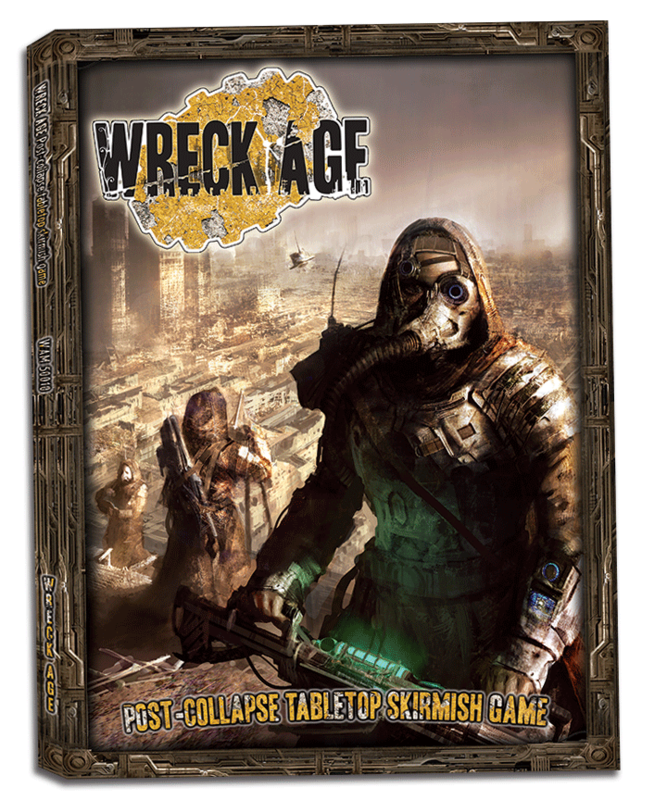 Wreck Age also has a line of 28mm scale miniatures, terrain, RPG adventures, and short stories set in the Wreck Age universe. Wreck Age is now available at DriveThruRPG.com! Wreck Age is a dystopian sci-fi world akin to Mad Max meets Blade Runner meets The Road. Inspired in part by; Tank Girl, Omega Man, 12 Monkeys, Book of Eli, Escape from New York, Dune by Frank Herbert, The Suns of Scorpio by Alan Burt Akers, A Canticle for Leibowitz by Walter M. Miller, the Stand by Steven King, The Native Tongue trilogy by Suzette Haden Elgin, The Walking Dead by Robert Kirkman, The World Without Us by Alan Weisman, and the Book of Dave by Will Self. We publish under a Creative Commons license to to reach and involve a wider audience; to not only grow our gaming community, but give back to it as well.